Look at the history of the clenched fist as a symbol of protest and solidarity. A national debate about race and proper military behavior broke out this week after sixteen African-American West Point cadets posed with raised fists for a pre-graduation picture. An inquiry at the academy found the cadets didn't violate any existing military rules that limit political activity. But the fists-up image led some to question if the woman expressed support for the Black Lives Matter movement, which is rooted in protests over what critics say is the excessive use of police force against African-American men. The picture, widely circulated on social media, was not intended as a political statement, according to West Point's superintendent, Lt. Gen. Robert Caslen Jr., who sent a letter to students. He did say the cadets showed "a lapse of awareness in how symbols and gestures can be misinterpreted and cause division." The gesture has a long history as a symbol of defiance and solidarity. Athletes have sometimes used a clenched-fist gesture as a political statement. Here's a closer look at the gesture. Who Else in History Used a Clenched-Fist? The gesture has a long history as a symbol of defiance and is often associated with both left-wing politics as well as oppressed groups. In the 1960s, the black power movement used it as a gesture to represent the struggle for civil rights. The Black Panther Party used it as a symbol of resistance. (John Minchillo/AP Photo) Democratic presidential candidate Sen. Bernie Sanders raises his fist to acknowledge the crowd before he speaks during an election night campaign event at the Big Sandy Superstore Arena, April 26, 2016, in Huntington, W.Va. In one iconic image, American sprinters Tommie Smith and John Carlos raised their fists during a medal ceremony at the 1968 Mexico City Olympic Games. Later, in an autobiography, Smith said he saw it as a "human rights salute." Is the Clenched-Fist a Political Statement? Sometimes a fist raised in the air is simply a fist raised in the air, even when political figures use the gesture. When South African civil rights activist Nelson Mandela was released from prison in 1990, he and his wife both raised a fist in triumph. After 27 years in jail, he had become a symbol of the struggle against apartheid in South Africa. Vermont Sen. Bernie Sanders has used the symbol on the presidential campaign trail this year while running for the Democratic nomination. He and others are using the fist pump to bring on cheers from voters and supporters. 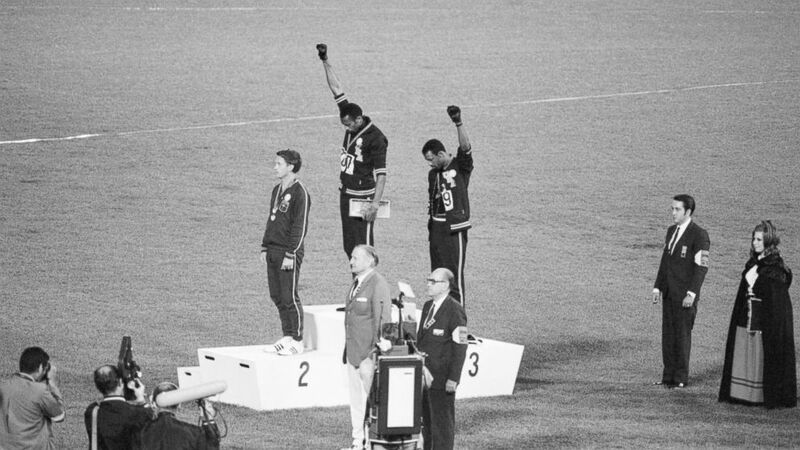 (Bettmann Archive) On Oct. 16, 1968, Tommie Smith, top center, and John Carlos, top right, extend their gloved fists in a victory stand protest against unfair treatment of blacks in the U.S. during the playing of the "Star-Spangled Banner", after Smith received the gold and Carlos the bronze for the 200-meter run at the Summer Olympic Games in Mexico City. 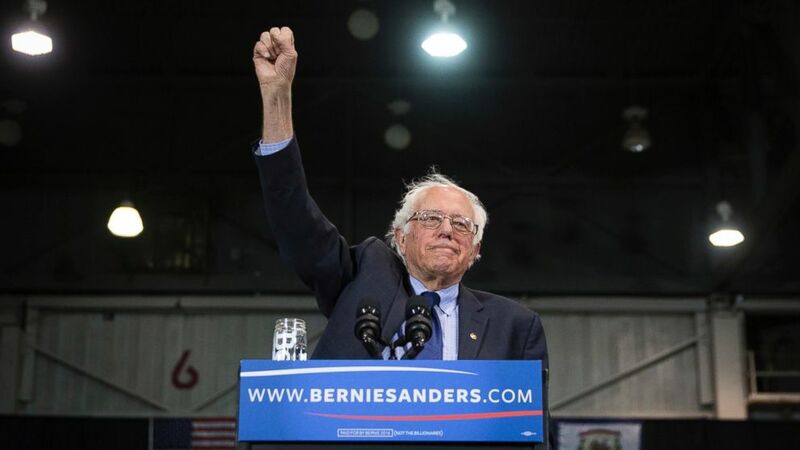 Sanders has often responded to the crowd and shows his fist as if to say “fight the good fight” and often does it when he appears on stage to show solidarity with the crowd. How Does the Clenched-Fist Relate to the Black Lives Matter Movement? While raised fists have frequently appeared in the Black Lives Matter movement, it isn't the only symbol used. It was used after the August 2014 death of unarmed teen Michael Brown in Ferguson, Missouri, to represent the "hands up, don't shoot" pose and has since been used at rallies and in social media posts. Defenders of the West Point cadets have said the women were celebrating their impending graduation, not trying to make a political statement.